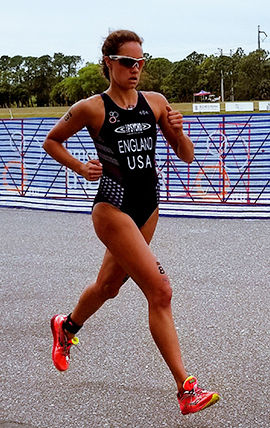 My name is Mary Alex England, and with the help of USA Triathlon’s Collegiate Recruiter, Barb Lindquist, I began my triathlon journey in July 2017 under Coach Jarrod Evans’ squad in San Diego, California. Coming from an NCAA running background at Ole Miss (Hotty Toddy), I was excited to try a new sport while becoming reacquainted with swimming and continuing to run. The past 8 months have been nothing short of a rollercoaster filled with highs from crushing swimming intervals to lows of getting frustrated with flying mounts (the rollercoaster comparison could also be equated to the rolling hills inland in Carlsbad that I’ve become all too familiar with on the bike). I’m beyond grateful for the opportunity to train for triathlon as a full time job and can’t wait to see where it leads me in the future. 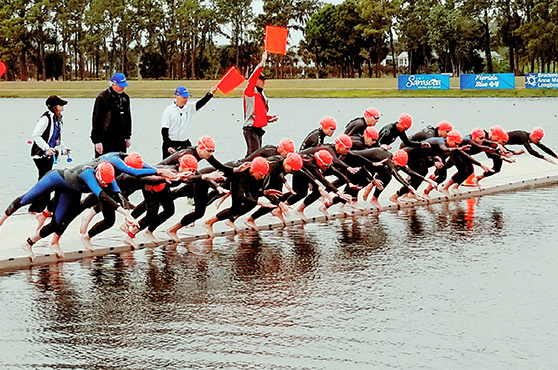 Our crew headed to Florida at the end of February for the Clermont CAMTRI and Sarasota CAMTRI races- how convenient that the two races were just a week apart and in the same vicinity! Coming to Florida, we expected heat and humidity, but the past two weeks were filled with unseasonably colder (relatively speaking) temperatures, which made perfect racing conditions. Race day in Sarasota was similar; overcast, mid 60’s, and a wetsuit swim. 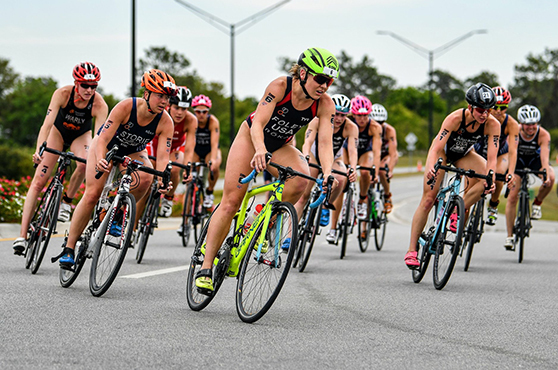 The course in Sarasota consists of a 750 meter swim from a pontoon start, a 20 kilometer bike consisting of 3 laps, and a 5k run consisting of 2 laps. The race is held at the Nathan Benderson rowing complex, and the open layout makes it incredibly spectator friendly. Three elite races into my triathlon career, I’m still not used to the quick gun start after the official yells “take your mark.” In track and cross country races, officials were notorious for holding athletes for what felt like eternity (aka maybe 3 seconds), but contrasting with the long pause before a start in track and cross country, the gun signaling the start of a triathlon is almost consecutive with “take your mark.” The pontoon start made for an aggressive swim to the first buoy, a straight shot from the pontoon, about 250 meters away. There was a lot of thrashing, ankle grabbing, shoulder pulling, you name it- Coach Jarrod warned us that a good start would be crucial for solid positioning in the swim, and a subpar start would put us too far back before the first buoy. Over the past eight months, I’ve been working on explosive power and quick reflexes, but I quickly found in the first few minutes into the swim that I needed to be in a better position if I wanted to make the first bike pack. I gained momentum and passed other athletes around the buoys and back into shore, but I still trailed where I needed to be. I came into T1 knowing I probably missed the first bike group and would have to make up ground. Sure enough, I was right. Luckily, I found myself in a chase bike pack with three other Americans and the lead bike pack well within distance to catch. The four of us pulled turns and worked the first lap of the bike to catch the lead pack before the end of the first lap. Between the lead pack and now the addition of the four of us, the group was about 10 riders strong, more than I rode with in my first two races. The course is pancake flat with some technical bits, but the largest challenge of the course was the wind. With a sizable group, there was more of a chance to position myself away from the wind. The next two laps lacked organization with several attacks that were all covered, but we managed to put over 90 seconds on the next group by the end of the three bike laps. As we came into T2, I became timid and unsure of where the dismount line was (I do not recommend either) and had one of the worst (and slowest) dismounts ever. The result of a poor dismount led to being the last of the group out of T2. I knew I had to focus and run hard to chase down as many people as I could. The mishap fueled my ferocity in catching half the pack within the first kilometer. By the end of the first run lap, I ran myself into fifth. I began the second lap and assessed where everyone was; I could see my teammate, Sophie, crushing the run and putting in a sizable gap, and second and third were becoming more out of reach. I kept repeating to myself “cadence, shoulders back (I immediately fixed my posture while typing this- ha), and hips up” instead of thinking about increasing effort and pushing. By the end of the race, I tracked down a fourth place finish. Looking back on the race, I’m not content with the outcome, but I’m not discouraged. Each race has highlighted things that I’ve done right (a reflection of a great coach and training program), and a million things that I need to improve upon in order to compete at a higher level. As we fly back to the west coast (ah, how I’ve missed my bed and white noise machine), I’m readily equipped with new things to focus on during training in order to improve as a triathlete. I’m so thankful for the support of USA Triathlon, Team Psycho, and the guidance of Coach Jarrod as I continue navigating triathlon. Onwards to another training block until we race again!